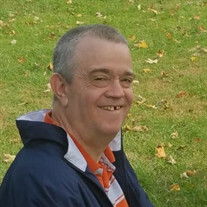 Stefan Pillman of Morristown, formally of Illinois where he lived most of his life, was born in Germany on Feb. 17, 1956 and passed away on Thursday, January 24, 2019 at UT Medical Center. He was preceded in death by his father: Franz; mother: Erika and big brother John. Stefan is survived by his sister: Margie, her husband Marc; brothers: Frankie, and Robert and his wife Carol; niece: Jennifer and her husband, Jose'; great nieces: Maria, Angelina and Gynessa. Nephew: Tonie; great nephews: Julian and Gabriel. Loving friends: Adam and his daughter, Zariyah, and Emma. Along with many other family members: Tommy, Carolyn, Danyell, Shawn, Tracy, Aaron, Mya and Faythe. He was loved by all who knew him and will be truly missed. A celebration service will be held at a later date for family and friends.